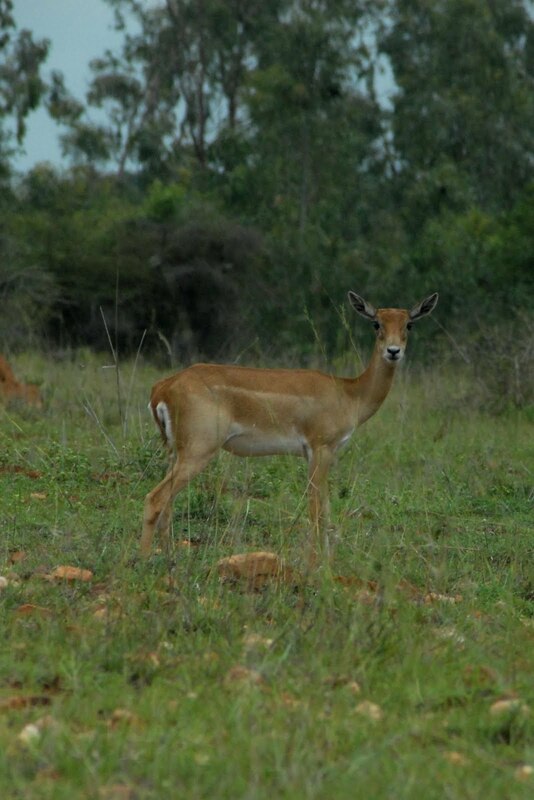 Jayamangali (formerly Maidenahalli) Blackbuck Conservation Reserve is Tumkur District's only notified protected area. It neighbours Maidenahalli, a small village in Madhugiri Taluk, at the north-eastern tip of Tumkur district of Karnataka state, India. This area is a part of the plains of Deccan plateau and borders Anantpur District of Andhra Pradesh. It is a 798-acre (3.23 km2) patch of grassland with Eucalyptus and Acacia auriculiformis. It has the largest contiguous population of Blackbuck (Antilope cervicapra) in Karnataka, apart from Ranibennur Blackbuck Sanctuary. The open grasslands of peninsular India were once widespread across the Deccan Plateau. Post- independence, however, they have shrunk to isolated patches thanks to immense pressure for cultivation, human habitation and other reasons that also include industrialisation. In 1987, the forest department of Tumakuru Division began protecting the area when the blackbuck’s presence was brought to their notice. In 1992, after sustained efforts by the forest department, the jurisdiction of the area was handed over from the Revenue Department to the Forest department. The Forest Department then fenced a portion of the area and raised a nursery. A concrete watchtower was erected along with two wood houses and watchmen sheds. But, the ownership of the land still rested with the revenue department. Tumakuru’s nature lovers worked hard to have the area granted the status of a Protected Area, like a wildlife sanctuary. The first ever Status Survey report on the area was published by Tumakuru-based Wildlife Aware Nature Club (WANC) in 1997. 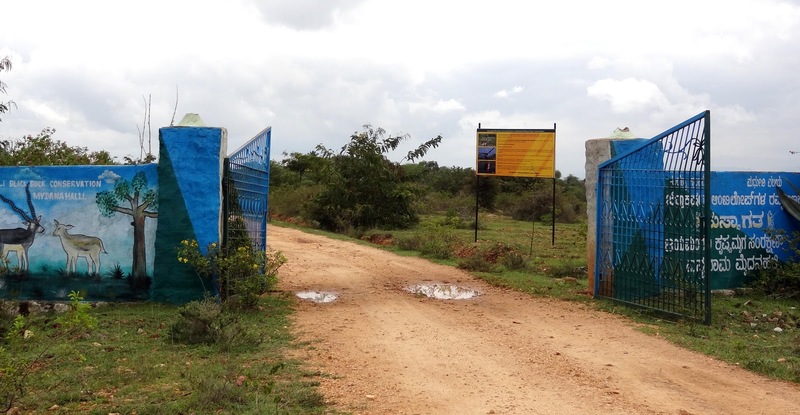 This helped the wildlife wing of Karnataka Forest Department to source data on this area and recommend it be declared a 'Conservation Reserve'. The Government of Karnataka accepted this proposal. In February 2007, vide Government Order No: FEE 342 FWL 05, 798.33 acres (3.2307 km2) of the area was finally notified as Jayamangali Blackbuck Conservation Reserve, (though the original area proposed to be included in this Conservation Reserve was 893 acres). 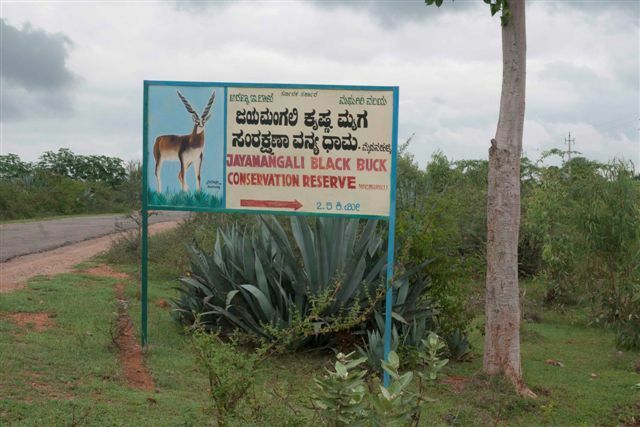 Thus, Tumkur District's first protected area was born. 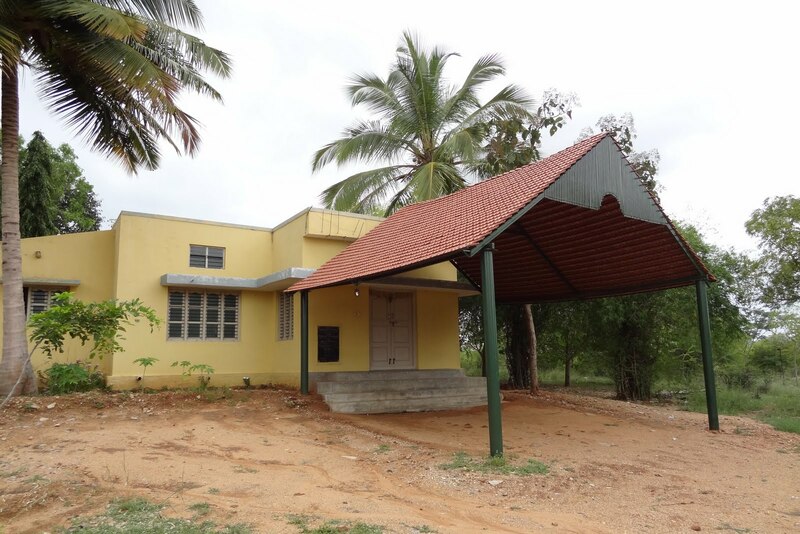 This area is located 23 km to the north east of Madhugiri town (Karnataka) and about 20 km to the west of Hindupur town (Andhra Pradesh). The geographical co-ordinates of the forest watch tower inside this area are 13 44’ 20” N and 7 19’ 41” E. It is located 4km away from the Jayamangali Blackbuck Conservation Reserve. The climate varies greatly according to the seasons- from a minimum of 8 degrees Celsius in winter to a maximum of 43 degrees Celsius in summer. The rainy season is from late June to mid-October. The average rainfall is approximately 300 to 350 mm. The vegetation is mainly plains grassland. More than 80 species of plants have been recorded from this area. Many of these plants have medicinal value. Sixty-seven species of butterflies belonging to seven families have been sighted in the area. Most of the species recorded are common throughout the Indian Peninsula and some are typical of the arid regions. Jayamangali (Maidanahalli) Blackbuck Conservation Reserve has the second largest contiguous population of Blackbuck in Karnataka, after Ranibennur Blackbuck Sanctuary. 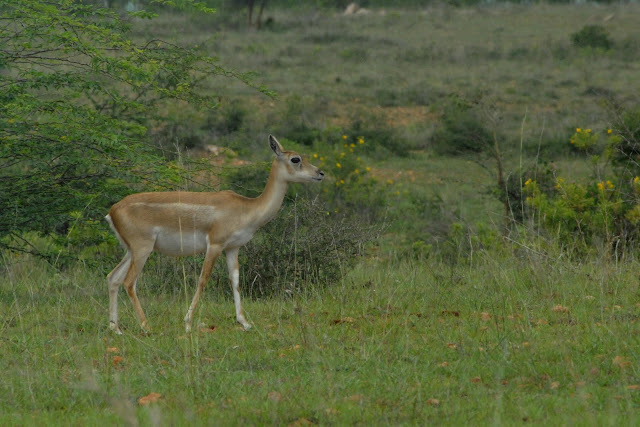 In total, 19 species of mammals belonging to 11 families have been recorded in the area, including the endangered Blackbuck. The first ever census of Jayamangali Blackbuck reserve was jointly conducted by the members of WANC and Karnataka Forest Department in the area on 15–16 November 1997, during which a population of 408 Blackbuck was recorded. 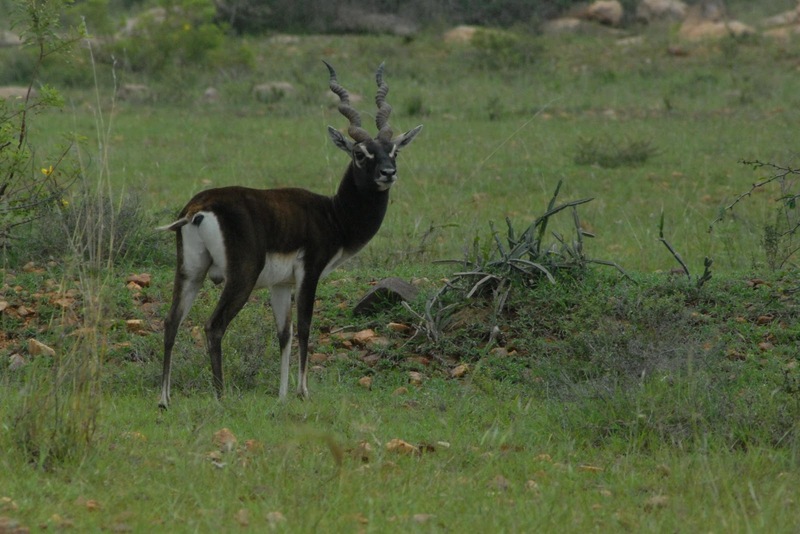 A subsequent census was held by the above on 1–2 October 2002, which revealed a population of over 600 blackbuck. 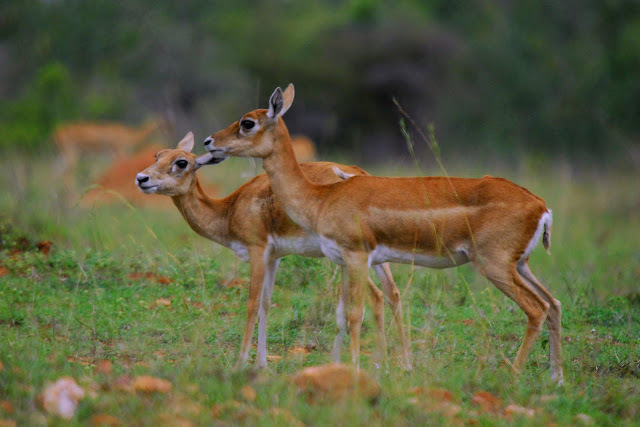 Apart from the blackbuck, other mammals present in the area include wolf, Bonnet macaque, Jungle cat, Small Indian Civet, Indian Gray Mongoose, two species of bats, and six species of rodents. About 125 species of birds belonging to 37 families have been recorded in the area, of which 22 are migratory. As expected of grasslands, the area is rich in ground birds, shrikes, larks and raptors. This is one of the few habitats in Tumkur District where the Indian Courser (Cursorius coromandelicus) and Painted Sandgrouse (Pterocles indicus indicus) have been seen. Some of the surrounding villagers claim to have seen the Great Indian Bustard in the past. Although none of the authors nor any birdwatchers have the bird in the area, efforts are on to sight this highly threatened species. Since it is a grassland, it has quite a number of reptiles typical of dry areas/plains. About 26 species have been recorded in the area, including 14 different species of snakes. 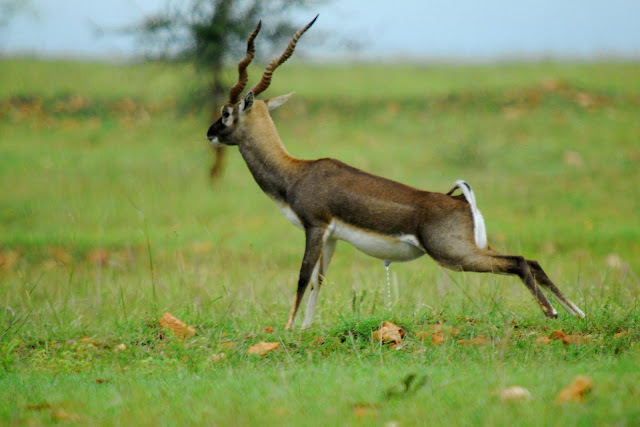 Blackbuck (Antilope cervicapra) is a species of antelope native to the Indian subcontinent. Their range decreased sharply during the 20th century. Since 2003, the IUCN lists the species as near threatened. This species is the only living species of the genus Antilope, and has been introduced in Texas and Argentina. 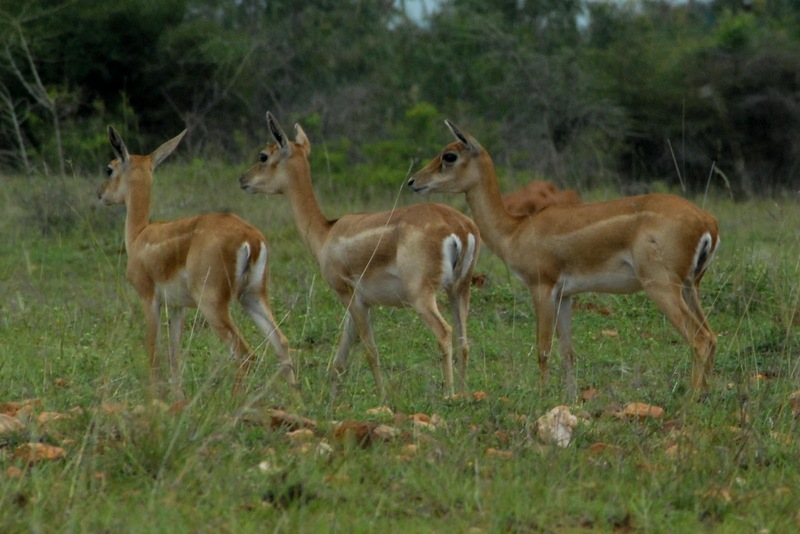 It is one of the fastest of all terrestrial animals reaching to speeds of up to 80 km/h and is one of the few antelopes where males and females have distinctive coloration, as the male bucks are a distinctive black and white and have long twisted horns, while females are fawn coloured with no horns. In its scientific name Antilope cervicapra, 'Antilope' from 'anthalops' (Greek) a horned animal; 'cervicapra' from 'cervus' (Latin) a deer and 'capra' (Latin) a she-goat. 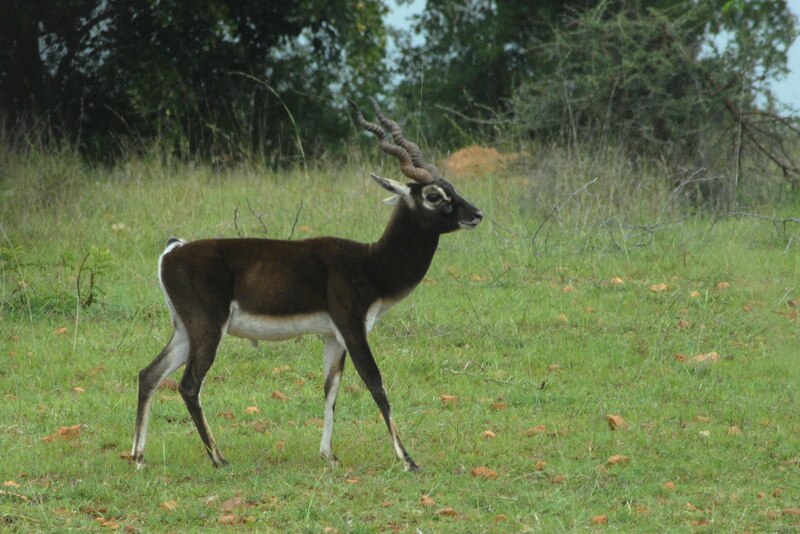 The blackbuck, is the provincial animal of India it is known as Krishna Mriga in Kannada. Also known as Krishna Jinka in Telugu, it has been declared as the state animal of Andhra Pradesh. Other local names for the species include Krishnasar in Bengali, Kala Hiran, Sasin, Iralai Maan, and Kalveet in Marathi. 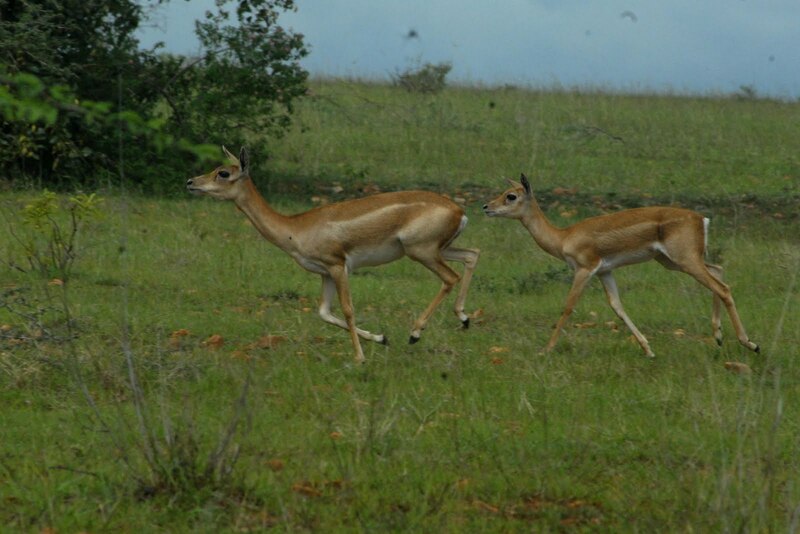 It is often simply called Indian antelope though this term might also be used for other Antilopinae from the region. The skin of Krishna Mrigam plays an important role in Hinduism, and Brahmin boys are traditionally required to wear a strip of unleathered hide after performing Upanayanam. The distinctive horns of the Blackbuck are ringed with 1 to 4 spiral turns, rarely more than 4 turns, and can be as long as 79 cm (31 in). 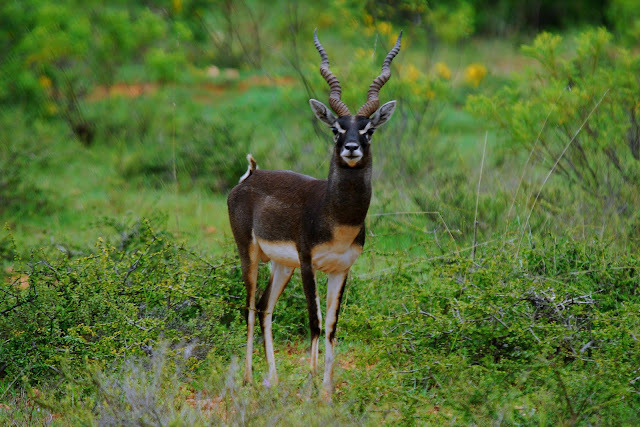 A trophy Blackbuck is greater than 46 cm (18 in). In the male, the upper body is black (dark brown), and the belly and eye rings are white. The light-brown female is usually hornless. 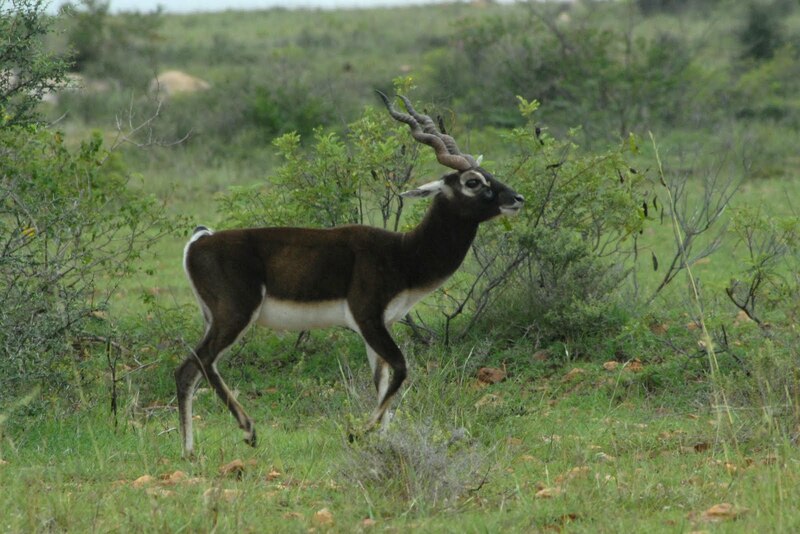 Blackbuck usually roam the plains in herds of 15 to 20 animals with one dominant male. 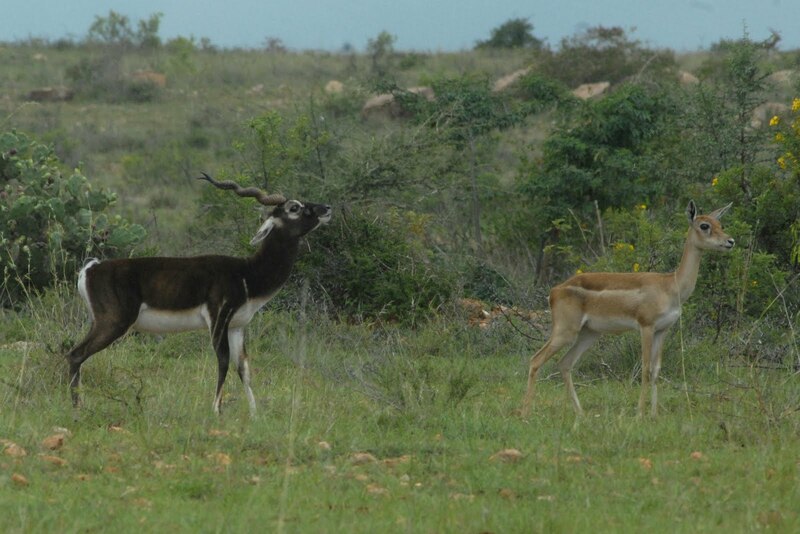 On the open plain, the Blackbuck is one of the fastest animals and can outrun most predators over long distances. Its chief predator was the now extinct Indian Cheetah. It is now sometimes preyed upon by wolves, feral dogs, etc. The diet of the Blackbuck consists mostly of grasses, although it will eat pods, flowers and fruits to supplement its diet. The maximum life span recorded is 16 years and the average is 12 years. 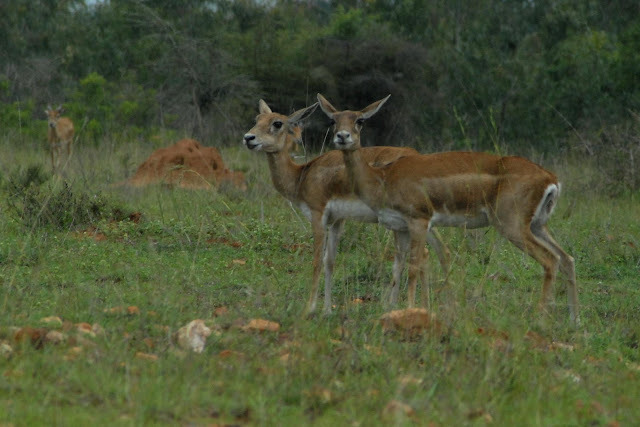 Albinism in Blackbuck is rare and caused by the lack of the pigment melanin. The animal looks fully white due to the lack of melanin in their skin. Wildlife experts say that the biggest problem with these Albinos is that they are singled out by predators and hunted. Originally spread over large tracts of India (except in North East India). Today the blackbuck population is confined to areas in Maharashtra, Orissa, Punjab, Rajasthan, Haryana, Gujarat, Andhra Pradesh, Tamil Nadu and Karnataka with a few small pockets in Central India. In Nepal, the last surviving population of blackbuck is found in the Blackbuck Conservation Area south of the Bardia National Park. In 2008, the population was estimated to comprise 184 individuals. The main threats to the species are: Poaching, Predation, Habitat destruction, Overgrazing, Diseases, Inbreeding and Sanctuary visitors. Large herds once roamed freely on the plains of North India, where they thrived best, but no longer. During the eighteenth, nineteenth and the first half of the twentieth centuries, Blackbuck was the most hunted wild animal all over India. Until India's independence, many princely states used to hunt this antelope and Indian gazelle, the Chinkara with specially trained pet Asiatic Cheetah. The Blackbuck is hunted for its flesh and its skin. Although Indian law strictly prohibits the hunting of these endangered animals, there are still occasional incidents of poaching. The remaining populations are under threat from inbreeding. The natural habitat of the Blackbuck is being encroached upon by man's need for arable land and grazing ground for domesticated cattle. Exposure to domesticated cattle also renders the Blackbuck exposed to bovine diseases. It used to be one of the most abundant hoofed mammal in the Indian subcontinent, so much so that as late as early 1900s, naturalist Richard Lydekker mentions herds of hundreds in his writings, though today only small herds are seen that too inside reserves, chief reason of their decline being excessive hunting. Till Indian independence in 1947, many princely states used to hunt the Indian Antelope and gazelle with cheetahs, which became extinct in 1960s. Though the royal sport had ended, growing cultivation saw it as crop-raider, further leading to its decline. Eventually, when in the 1970s several areas reported their extinction, it was enlisted as a protected animal under the Wildlife Protection Act of 1972. ConservationLike most wild animals, the Blackbuck is in principle protected in India by the Wildlife Protection Act of 1972. Its protected status has gained publicity through a widely reported court case in which one of India's leading film stars, Salman Khan, was sentenced to five years imprisonment for killing two black bucks and several endangered chinkaras. The arrest was prompted by intense protests from the Bishnoi ethnic group, which holds animals and trees sacred, and on whose land the hunting had taken place. In another notorious incident of criminal poaching, Mansoor Ali Khan Pataudi also killed a Blackbuck, and then absconded as a fugitive. He finally surrendered only when the case was transferred from the criminal court to a Special Environment court, where he would face lighter sentencing.The Founder Chairman PFA Haryana Naresh Kadyan, whistle blower in this case - also booked by Jhajjar Police for no reasons but he moved public interest litigation before High Court, Chandigarh and get transferred this case from Jhajjar to Faridabad. 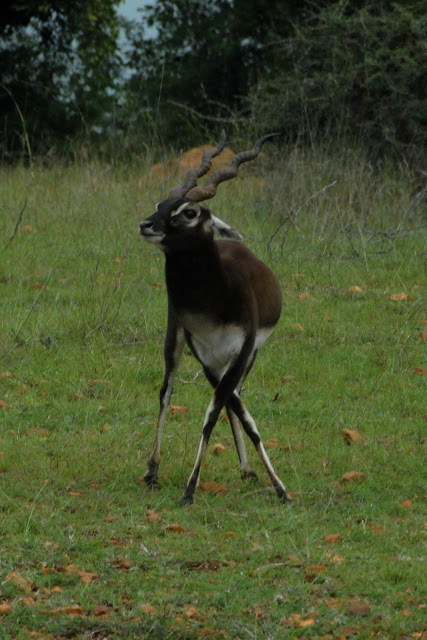 Fortunately, the Blackbuck population is stable with 50,000 native individuals, plus an additional 43,000 descended from individuals introduced to Texas and Argentina. The species can be seen in zoos. They are also found in an open area near Dindori, Madhya Pradesh at Karopani Black Buck Conservation Area, which is located approximately 15 Km from Dindori. MythologyAccording to the Hindu mythology Blackbuck or Krishna Jinka is considered as the vehicle (vahana) of the Moon-god Chandrama. According to the Garuda Purana of Hindu Mythology, Krishna Jinka bestows prosperity in the areas where they live. A blackbuck is featured in the 2010 film Prince of Persia. 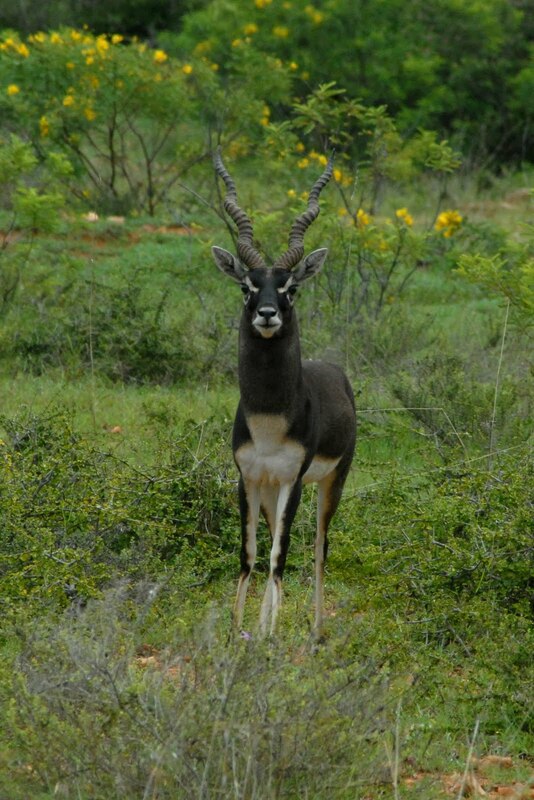 During the early part of the 20th century Blackbuck were exported from India for sport hunting and ornamental purposes. Large feral populations now exist in Texas and Argentina. First introduced into Texas in 1932 in Kerr County. By 1988 free-ranging populations existed in eight texas counties. Farther, expansion of this range is limited by cold weather, coyote predation, and parasitism. In Argentina blackbuck were introduced in 1940 in the Santa Fe Province and later introduced into Buenos Aires, Entre Ríos and La Pampa provinces. Along with Blackbuck, Axis Deer or Chital, Barasingha, and Nilgai were also exported. Blackbuck are classified as Class 1 pests in Queensland, Australia. It is illegal to own them without a permit or release them into the wild. Animals in violation of this are subject to eradication by the state and penalties up to $80,000 apply to the individuals responsible. good report and nice pictures. i could have guided you properly to go . But its o.k. nice greenery also. Very nice pictures and nice place. Will go when i come next time. Nice pictures sateesh , what kind of an slr and lens do you use?